Here's hoping for no blood loss as she makes her way to Edinburgh for this year's Fringe. It'll be the first time at the festival for this character comedian and clown, but over in the US, Palamides has form. Originally from Pittsburgh, Palamides worked with Philadelphia's acclaimed Pig Iron Theatre Company, and is now on a team at renowned comedy and improv breeding ground, LA's Upright Citizens Brigade Theatre. In LAID, which comes to the Fringe via Soho Theatre, she'll be donning said giant egg costume for the stage, where she'll lay an egg every day and faces the same decision each time – should she eat it, or nurture it? Thoughtful words – but don't be fooled, this show has plenty of silly to throw at its audience. After all, it's directed by renowned clown and Fringe favourite Doctor Brown (aka Phil Burgers), who won the Edinburgh Comedy Award in 2012 for his beguiling, bizarre and utterly hilarious Befrdfgth. It's a partnership that was born when Palamides started taking Burgers' clowning classes. And now it's coming to Edinburgh, she's feeling the pressure of having the Doctor Brown stamp of approval. Not that he's letting her rest on her laurels. Burgers' success has done a lot to change people's perceptions of clowning in comedy at the Fringe, though Palamides says she still has to explain to people the difference between her clowning and circus clowns. Loads, apparently – so many that Palamides has to put a huge tarp down to be able to clear up the soiled stage quickly enough after every show. 'I think people are grossed out,' she admits. 'But that's all part of it, it's raw. I've got eggs going everywhere, I've got this woman going through labour, eggs are dying, eggs are getting eaten. There's life, there's death. It's madness.' Perfect, then, for this mad month of August in Edinburgh. Pleasance Courtyard, 5–27 Aug (not 14), 4.15pm, £10–£12 (£9–£11). Previews 2–4 Aug, £7. 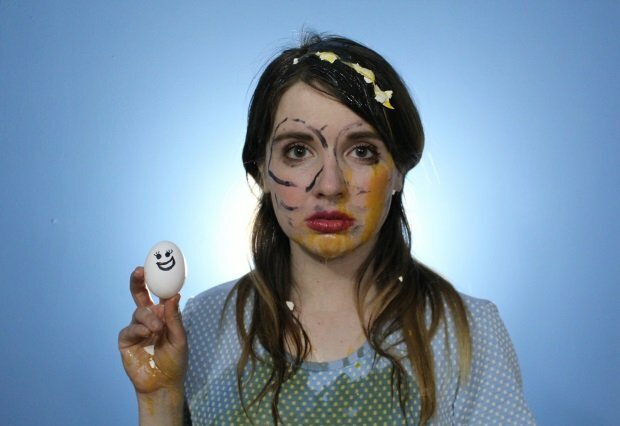 LA based comedian andUpright Citizens' Brigade performer Natalie Palamides explores motherhood with absurd dilemmas, silly routines and surreal physical comedy. Palamides won the coveted Edinburgh Comedy Award for Best Newcomer at the 2017 Edinburgh Festival Fringe. Character comics at this year's Fringe explain how far they'll go to have a fictional person seem all-too real.